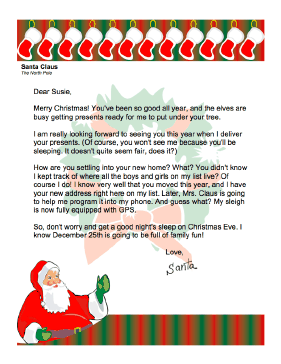 This printable letter from Santa Claus lets a child know that even though his or her family moved during the year, that Santa knows their new address and will be sure to drop by on Christmas Eve. Merry Christmas! You've been so good all year, and the elves are busy getting presents ready for me to put under your tree. How are you settling into your new home? What? You didn't know I kept track of where all the boys and girls on my list live? Of course I do! I know very well that you moved this year, and I have your new address right here on my list. Later, Mrs. Claus is going to help me program it into my phone. And guess what? My sleigh is now fully equipped with GPS. So, don't worry and get a good night's sleep on Christmas Eve. I know December 25th is going to be full of family fun!